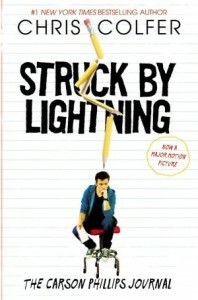 Struck by Lightning: The Carson Philips Journal - Chris Colfer - review - The YA Book Blog! I love Chris Colfer from Glee and I was really excited when I saw he was publishing a couple of books. I picked this one up from the library as soon as I saw it on the shelves. Struck by Lightning tells the story of Carson Phillips whose greatest ambition is to study and Northwestern and go on to be a journalist. This book turned out to be a real disappointment for me. I started out with really high hopes because I like Chris Colfer and had been wanting to read this for a while. Usually I love books written in a diary style, but that was one of my biggest problems with Struck by Lightning. The book is written in journal entries, but Carson's voice just didn't read like a diary entry. It should be a great way to get inside somebody's head because a diary can be such a personal thing but I just did not get those vibes from Carson's journal. The second major obstacle for me was Carson himself. He's horrible. 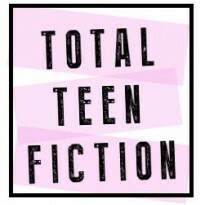 Now, I've read books in the past with horrible main characters and still been able to like the book and connect with the story, but I just couldn't get past the fact I couldn't stand Carson. Not only is he rude to everyone around him, but the main plot revolves around him blackmailing people for his own benefit. I just didn't like that at all. I was hoping there'd be some moment of redemption where I'd suddenly understand why he was like he is and change, but by the time there was any tiny glimmer of hope of that happening, I was 200 pages in and it was way too late. I get that his family situation isn't great (his parents are separated, his dad abandoned him and his mum is really messed up, his grandmother is in a care home etc.) but I just couldn't connect with Carson enough to feel for him. The other characters let me down slightly as well. I felt like characters such as Malerie and Ms Sharpton were intended to provide comic relief and I just didn't find them funny. In fact the humour throughout the whole book was sadly lacking for me. I think sense of humour can be quite a personal thing butall of the set-ups in Struck by Lightning fell flat for me. The good thing about Struck by Lightning is that's it's a quick read. I think as a book to kill a few hours it was fine. It managed to keep my attention all the way through, but I was starting to get a little bored by the end. Nothing grabbed me and made me want to invest in the story and the characters and I think if it was any longer it would have lost my attention. Even the dramatic twist at the end didn't really grab me. I was so sad to finish this book with the feeling of disappointment I had. I'm sure there are some people who will love this book, and after seeing the pictures of the film which were included in the copy I read I'd be interested to see that and see if the story being told through a different medium made it more enjoyable, but for me there were just too many obstacles to enjoy it as a book.